Preheat oven to 450°F. Microwave the milk on high for 2 minutes, or until warm to the touch. Sift the flour, salt and baking powder together in a large mixing bowl. Beat the eggs at medium speed for about 3 minutes, until foamy and pale in color. Stir in the warm milk at low speed. Gradually add the flour mixture to the beaten eggs at low speed. Beat for 2 minutes on medium speed. Let the batter rest for 1 hour at room temperature. Spray the popover tin heavily with non-stick spray. Fill cups almost to the top with batter. Place popover tin on a cookie sheet. Bake 15 minutes at 450°F. Reduce heat to 375°F and bake for 30 to 35 minutes more. 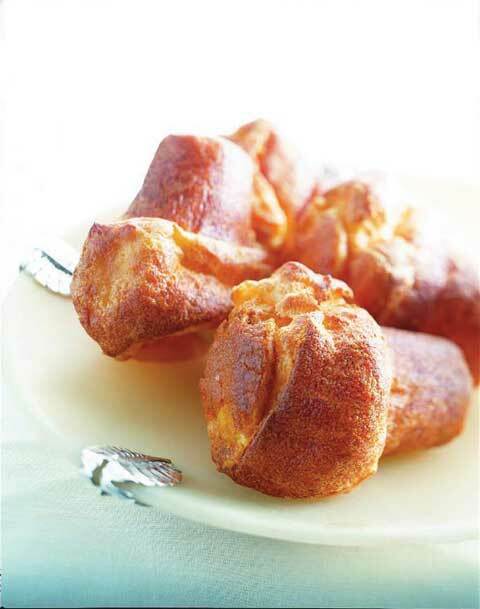 Popovers should be a deep golden brown on the outside and airy on the inside. Serve hot with strawberry butter. Beat the butter until light and fluffy. Add the preserves and beat until well combined. To serve, spoon or pipe into one-ounce ramekins or bread and butter plates.